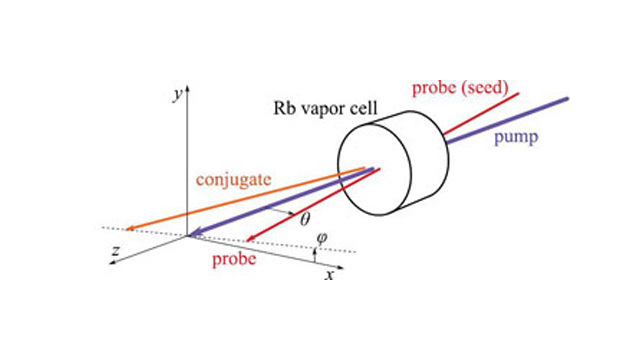 Two incoming beams [marked “pump” and “probe (seed)”] pass through a rubidium vapor cell, amplifying the probe beam and generating a “conjugate” beam. The output probe and conjugate beams have highly interrelated properties. The two-beam squeezing technique works for most types of light beams. 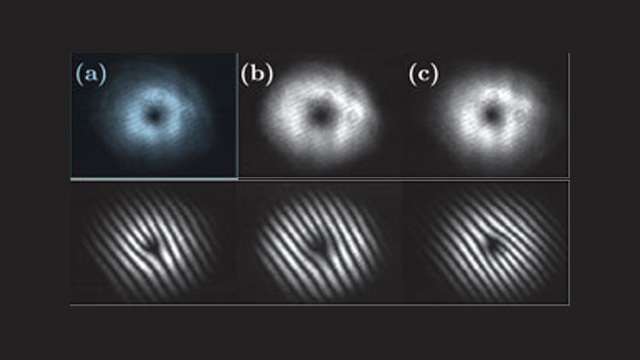 This picture shows the intensity of an (a) input probe beam, (b) output probe beam, and (c) conjugate beam for light that has a special property known as orbital angular momentum. Subtracting the intensity of the two output beams showed squeezing of about 7.3 dB, corresponding to less than 25% of shot noise. JQI researchers have demonstrated a specially interconnected pair of “squeezed light” beams, reduced-noise optical waves whose properties are related to each other to a degree greater than allowed by classical physics. The unusual feature of these beams is that, unlike previous such demonstrations, the beams are multi-mode, that is, they can carry multiple pixels of information in parallel. These twin squeezed-light beams may be useful for quantum imaging, a new form of optical processing that would use the rules of quantum mechanics to achieve various unprecedented feats with light. JQI/NIST’s Vincent Boyer, Alberto Marino, and Paul Lett* created the beams through a convenient and flexible technique known as four-wave mixing (4WM), in which two incoming light beams combine to generate two different outgoing light beams. According to classical physics, any beam of light has at least a minimum level(Generation of Spatially Broadband Twin Beams for Quantum Imaging,” V. Boyer, A. M. Marino, and P. D. Lett, Phys. Rev. Lett. 100, 143601 (11 April 2008)) of noise, known as the “shot noise,” which consists of naturally occurring random fluctuations in all of its properties such as intensity. The quantum-mechanical process of “squeezing” a beam can reduce the shot noise to below classical levels in a single property such as intensity, at the expense of raising the noise in a complementary property, in this case, the phase, which specifies the precise locations of the crests and valleys in the light wave. While many squeezing experiments involve adjusting the noise levels within a single beam, this experiment demonstrates squeezing that involves two interconnected beams. 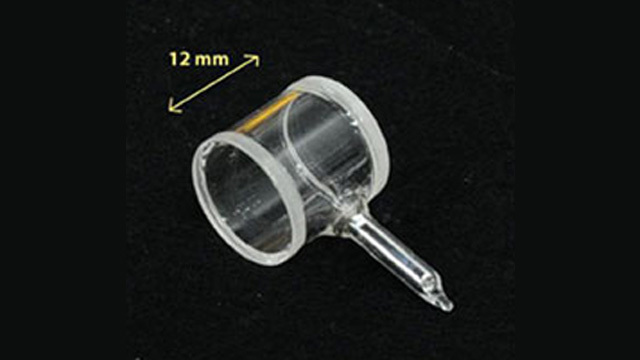 In the setup, a lowintensity “probe” beam meets a high-intensity “pump” beam in a 12-mm-long cell of rubidium vapor. Interactions between the rubidium atoms and the light beams give rise to a 4WM process that amplifies the probe beam and generates the conjugate beam. When the researchers sent the probe and conjugate beams to two detectors and subtracted the two detector signals, they found that the noise in the intensity of the subtracted signals was about 30% of the shot noise. Therefore the fluctuations in the beams were highly interconnected or “correlated”--at levels much greater than classically possible. Moreover, these two beams had convenient properties. Each beam was “spatially multi-mode”—in other words it contained more than one pixel of information. And even though the squeezing between the two beams was interconnected, each individual beam contained several independent modes of squeezing—so that squeezing one spatial mode of a beam would not affect the squeezing properties of the other spatial modes in the same beam. Such multi-spatial-mode two-mode squeezed beams of light would be useful for quantum imaging, which, for example, could allow researchers to reduce noise in one beam and pack more information in it. the squeezing properties of the other spatial modes in the same beam. Such multi-spatial-mode two-mode squeezed beams of light would be useful for quantum imaging, which, for example, could allow researchers to reduce noise in one beam and pack more information in it. Another quantum imaging application would be to increase the sensitivity of signals by reducing intensity or phase noise and detecting smaller changes in the beam. Quantum imaging also opens the possibility of creating sharper images than allowed by classical physics, and performing simultaneous “parallel” processing of picture elements in beams that lie in two separate locations.